Eliska was a warrior Princess; Eric a normal human. They had different Worlds. Eliska from a world where the identity is never revealed to the humans. But, Destiny had a different plan. When she was assigned the task to protect the last remnants of her race, she never expected the Dark Forces to be so strong. In the end, she had to take a decision; a decision that not only affected her world, but somehow, the destiny of Eric got intertwined with hers. Her failure to save her race brought Eric into the center of an unexplained phenomenon. He started to meet people and visit places that were unknown to humans. But, it seemed he was connected to that world. There were signs that all these happenings were not random. Someone, somewhere had changed his destiny. Would he know the reason of his survival? Will he come to know what Eliska did? And, Will he find his destiny? This is the complete epic science fiction adventure in one volume, containing all three novels: Convergence, Gravity, and Stratagem. SPECIAL FEATURES: Two maps from the original hardcover (out of print), a reference section, and a "Deleted Scene"... a complete, extra short story of an incident referred to in both Convergence and Gravity. 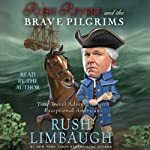 Nationally syndicated radio talk-show host Rush Limbaugh has long wanted to make American history come to life for the children of his listeners, so he created the character of a fearless middle-school history teacher named Rush Revere, who travels back in time and experiences American history as it happens, in adventures with exceptional Americans. In this book, he is transported back to the deck of the Mayflower. Holding Out for Skye by S.R. McKade is a pure love story. Skye Fletcher and Cian Hunter are destined to fall in love from the first page but their journey is so worth the read. Skye doesn’t like Cian and Cian tries his best to annoy Skye, but little by little that changes. The romance which starts by accident and takes many twists and turns is so very real. Kiera, Tyler, Ash, Nick and Tasha, each having their own romances can’t help, but instantly see that there is love blooming between Skye and Cian. We the readers have the privilege of following along for both the good times and the not so good times, the break-ups, the disagreements, the shopping sprees, the dates, and so much more that makes this story so heartwarming. S.R. McKade has written two hundred and three pages of love. Holding Out for Skye is a treasure not to be missed. It is a warm and fuzzy love story and impossible to stop reading. I wanted so badly to reach the end and see what really happens to Skye and Cian and I hated that I reached the last page and had to leave all of my new friends behind. If you are a fan of romance, falling in love, and the true meaning of friendship this book is a must read. Holding Out for Skye is a starry-eyed love story winner. I can’t give S.R. McKade enough kudos for this book. I look anxiously forward to reading more from S.R. McKade and have placed Holding Out for Skye on my favorite love story book list. Inside all of us, there is darkness. Inside Clive, it's tangible, and it's aching to get out. A disheveled Clive stands alone in a hospital waiting room. A series of incidences have led him to undergo unnecessary neurosurgery. A voice inside Clive's head nags him to kill the doctor. Weeks prior, a murder investigation and an unrelated kayaking excursion set the story's interlocking events in motion. When a remorseful killer, a bomb-happy psychopath and a mysterious widow spider converge upon Clive, they bring with them destruction and death. Clive must discover who or what is steering his very existence before he, too, is consumed by the carnage around him. confront Chester and his own demons. But is he powerless to overcome them? What Hides Within is a Finalist for "Best Horror" in eFestival's Independent eBook Awards and has been named to Best of 2012 by A Thousand Lives book blog. Valerie Diaz has a power that she can't contain, and it's killing her. On the Globe, imaginary friends come to life, the last of the unicorns rules the realm, and magic seeps from the pores of all the Conjurors who live there. But choosing to embrace her potential will set Valerie on a treacherous course - one filled with true love, adventure and perilous danger. Kristen Pham lives for really great fudge, rollercoasters, and exploring new worlds via fiction. She lives in San Jose, CA with her son (Jake) and husband, where she eagerly waits for Jake to turn eleven and receive his invitation to Hogwarts. Her childhood memories of adventures with her imaginary friends inspired The Conjurors Series. You can reach her on Twitter (twitter.com/theconjurors), Facebook, and her website (kristenpham.com). Florence Osmund invites you to read her latest novel, Red Clover, and submit a photo that portrays one or more aspects of the storyline. The winning entrant will receive a $100 American Express gift card. The rules and how to enter can be found on her website. After more than three decades of working in corporate America, Florence Osmund retired to write novels. She earned her master’s degree from Lake Forest Graduate School of Management while establishing an active career in administrative and human resource management. Since retiring, she has published three novels and is working on a fourth. Her website is dedicated to new and aspiring authors and offers considerable writing advice, book promotion and marketing strategies, and many helpful website links. Osmund currently resides in Chicago where she enjoys all the things that great city has to offer and (of course) reading and writing. Penny Pincher Journal: How To Save Money Every Day provides valuable tips on saving money every day. Spend a day with Dr. Penny Pincher and learn to save $17,000 per year! Dr. Penny Pincher has a Ph.D. in engineering and likes to share the ways he has found to enjoy life more while spending less money. Learn how to spend less money on food, shoes, clothing, heating, fitness, razor blades, gasoline, coffee, jeans, cake, pet food, vehicle expenses and more. Plus, learn some easy ways to make money as you enjoy frugal living. Penny Pincher Journal will help you identify ways to enjoy life more and spend less money. How is this possible? Many things that people spend money on are simply not necessary and do not contribute to their happiness. Dr. Penny Pincher likes to find ways to eliminate unnecessary things that consume money and waste time. Dr. Penny Pincher has a Ph.D. in engineering and lives and works in eastern Iowa with his wife and two sons. In 2013, Dr. Penny Pincher founded Penny Pincher Journal, a blog about saving money every day. His hobbies include drinking great coffee, annoying his family, riding his cheapcycle (cheap bicycle), and saving money every day. For some acts there is no redemption, for some sins no forgiveness, no matter the sum of a man’s works” - Those were the last words of Gina Porter penned in the institution where she spent her last years living in madness. The scribble found on a hastily drawn note would prove prophetic as the two secrets she kept buried deep inside her soul most of her life would collide. Meanwhile, the secret the six conspirators thought they had buried more than twenty years ago was not buried deep enough as someone has returned to seek vengeance from the ashes of the long-forgotten tavern. One by one the keepers of the secret sin are being killed in brutal fashion, the words Red Dog written in their own blood at the scenes of the macabre crimes. For the conspirators, the words are like writing on the wall, forewarning them of their fate, reminding them of the atrocities they committed long ago. The time for restitution is gone, payment now demanded for the tab they ran up at the long gone honkytonk, a tab for which each of them is equally responsible. For Sheriff Sam Delaney the words are the only clue to solving who or what has turned the normally peaceful Castle County into a killing field, the body count rising nightly. The veteran lawman seems to stay one step behind the force which the press dubs the Red Dog Killer, the community losing faith in the sheriff in light of the homicidal rampage which seems to have no end. To stop the killing spree the sheriff must first solve a crime that is two decades old, a cold case which is getting colder by the day. Even as he races against time to solve the puzzle, forces will stop at nothing to make sure the secret of the Red Dog stays hidden. Making his challenge even tougher is the fact the witnesses to the crime are the ones dying, each falling victim to the mysterious reaper as the sheriff gets tantalizingly close to exposing the long-kept secret. Faced with their own mortality, the conspirators become their own worst enemy as they struggle to not only keep the secret but to avoid becoming the killer’s next victim, each ready to do anything to avoid their fate even if it means sacrificing an old friend. The question begs, when everything is exposed to the world in the end, which is worse, their secret sin or the one who has come to exact vengeance for their horrific evil? R.D. Sherrill is the Senior Writer for the Southern Standard newspaper in McMinnville, Tennessee where he has served as crime and courts reporter since 1990. He has received numerous awards during his career, including state honors for news writing and in column writing, both in the serious and humor categories. He is a graduate of Tennessee Tech University where he majored in Political Science. He resides along with his family in the town in which he was born and raised. Most of his works are set in small towns since he has spent most of his life living in rural America. While writing thousands of news stories, Red Dog Saloon is his debut novel. I have read many books and love a good thriller or murder mystery. When I read the reviews I thought it was a good book to begin. I was definitely drawn in. The thing I liked the most about the book was the fact that it was not in the least predictable. Just when I was sure I had it figured out, it took another twist and turn. The ending was totally unexpected. If you are looking for a good read that will have you thinking about it long after you've read the last page, hold on to your hat you're in for a wild ride.